It used to be that a single axis was sufficient to satisfy existing and new motion control applications. When microelectromechanical systems (MEMS) accelerometers were initially introduced about 20 years ago, the benefits of circuitry inside an integrated circuit (IC) size package with the sensing element provided significant advantages for users. If more axes were required, the system designer used more sensors and addressed all the issues that were involved. Today, six degrees of freedom (6DoF) inertial measurement units (IMUs) are simplifying the systems designer’s task and providing new benefits for applications such as consumer electronics, games, healthcare monitoring, industrial applications, automobiles and more. A quick comparison of 6DoF inertial measurement units shows dissimilarities but the product data sheets need to be reviewed carefully for all the subtle differences. Six degrees of freedom is the ability of a rigid body to move in three perpendicular axes combined with rotation about three perpendicular axes – pitch, yaw and roll. Movement along each of the three axes is independent of the others and independent of the rotation around any axis so the motion has six degrees of freedom. Package level integration of a 3-axis accelerometer and a 3-axis gyro minimizes misalignment that can occur in discrete solutions. There are several choices available that allow the system designer to evaluate the tradeoffs of one design versus another. STMicroelectronics iNEMO (iNErtial Module) 6DoF sensor integrates three-axis sensing of linear and angular motion in a 4 x 5 x 1-mm package. ST calls its LSM330DLC a system-in-package. The design is fully software-compatible with the company’s latest-generation 3-axis digital accelerometers (LIS3DH) and gyroscopes (L3GD20) providing designers a simple upgrade path to reduce the size of their IMU solution. STMicroelectronics’ LSM330DLC counts motion activated and intelligent power saving features among the features inside its 4 x 5 x 1-mm package. A package-level integrated solution provides inherent alignment of the two sensors’ reference axes. In addition, the mechanical sensing structure’s design ensures a high level of thermal and mechanical stability. The sensor has a user-selectable full-scale acceleration range from 2 to 16g with angular-rate detection from 250 to 2500 degrees per second (dps) along the pitch, roll and yaw axes. According to Yole Développement, an increasing number of industrial applications are likely to use an accurate motion detection and control to create differentiated products or even entirely new classes of products. The market research firm expects the industrial market for IMUs to grow at an annual rate of 18.8% in the next two years reaching $897 million in 2015. One of the first, if not the first, co-packaged tri-axis gyroscope and tri-axis accelerometer combinations was introduced by Analog Devices in June of 2008. The ADIS16360/ADIS16365 iSensor IMUs have factory calibration that characterizes each sensor’s sensitivity, bias, alignment and linear acceleration (gyro bias). Dynamic compensation formulas for each sensor provide accurate sensor measurements. 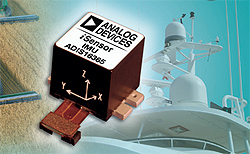 Analog Devices 23 × 23 × 23-mm IMUs target industrial applications. The digital gyroscope has range settings of ±75, ±150 and ±300 dps (degrees per second) and the digital accelerometer has a ±18 g measurement range. Designed for industrial systems and not portable electronics, the sensor measures 23 × 23 × 23 mm and has a flexible connector interface that allows multiple mounting options. The sensor’s Precision AutoNull, and a 0.05 dps/g dynamic linear acceleration compensation factor enable equipment designers to achieve in-run bias stability of 0.009 dps or better without further motion testing calibration. The sensor’s programmable serial peripheral interface (SPI)-port provides access to change many of the device’s features. With a bandwidth of 330 Hz for both units, the calibration temperature range of the ADIS16360 is at +25°C and the ADIS16365 is from −40°C to +85°C. The Epson S4E5A0A0 6DoF sensor has an SPI and a UART interface. Another 6DoF sensor that addresses industrial and other more rugged environments including automotive and construction applications is Epson’s S4E5A0A0. Epson’s IMU uses quartz gyroscopes the company calls QMEMS to sense movement very accurately. The unit boasts the lowest angular rate output noise based on rate noise density. The IMU, a Double T nanostructure design, provides a Q factor of about 30,000 or about three times the capability of a tuning fork design. Unlike tuning forks that are supported at one end using a cantilever, the Double T is supported in the center and it detects movement on the Z axis versus the X axis. Tracking at 300 dps, the gyroscope bias instability is less than 6 deg/hr and its angular random walk variance is less than 0.24 deg/ √-hr. The unit is factory calibrated for operation over a temperature range of -20 to +70°C. Its external packaging dimensions are 24 x 24 x 10 mm. InvenSense MPU-6000 motion processor features a three-axis gyroscope, a three-axis accelerometer and a Digital Motion Processor (DMP) hardware accelerator for processing nine-axis motion algorithms, all on the same silicon die housed in a 4 × 4 × 0.9-mm package. The InvenSense MPU-6000 crams a lot of features into a 4 × 4 × 0.9-mm QFN package. The DMP provides a digital-output of six or nine-axis MotionFusion data in rotation matrix, quaternion, Euler Angle or raw data format. External magnetometers and other sensors provide additional inputs to the algorithms. The design allows precision tracking of both fast and slow motions. The user-programmable sensor provides a gyro full-scale range of ±250, ±500, ±1000 and ±2000 dps and an accelerometer full-scale range of ±2g, ±4g, ±8g, and ±16g. Both popular SPI and I2C interfaces are available but not in a single product. The MPU-6050 supports I2C communications at frequencies up to 400 kHz and the MPU-6000 supports SPI at up to 20 MHz. Additional integration includes an embedded temperature sensor and an on-chip oscillator with ±1% variation over the operating temperature range. The 6DoF IMU from SensorDynamics, recently acquired by Maxim Integrated Products, uses patented dual-cavity technology that has been proven in SensorDynamics’ 2D combo sensor. In a 6 x 6 x 1.2-mm package, the SD746 delivers a measurement range of ±2048 dps for angular rate and ±8g for acceleration with temperature-compensated and factory-calibrated digital measurements. Supplied in a 40-pin QFN package, SensorDynamics 6DoF IMU has an operating temperature range of -40 to +85°C. The unit has a wake-up by motion feature, a stand-by mode with a current consumption of only 5 µA and a noise density less than 0.03 dps/√Hz. The motion detection mode turns off the gyros while the accelerometers operate in a pulsed mode, consuming 25 µA at the 1 Hz accelerometer sample rate. If 6DoF is not enough control for the application, some suppliers even throw in a 3D magnetic field sensor as well. For example, MEMSense Micro IMU, offered in a 2.276-in. diameter × 0.956-in. height housing, can address rugged and military environments. The IMU has an accelerometer range of 2, 5 or 10g ±1g, while the gyro has a 0-150, 0-300, 0-600 or 0-1200 dps range with custom ranges available up to 3000 dps. The unit has a standard bandwidth of 50 Hz or 10-75 Hz as a custom option. The rugged aluminum housing of the MEMSense Micro IMU contains a 6DoF IMU as well as a triaxial magnetometer. In addition to its triaxial magnetometer (compass), the sensor has an I2C protocol and RS422 protocol digital outputs. The Micro IMU is offered in both military (-40 to +85°C) and commercial (0 to +70°C) temperature ranges and is also available with optional triaxial high G accelerometer in 35g and 50g ranges. Considering physical size alone, there are a wide variety of options for system designers. Table 1 shows a summary of the IMUs that have been presented. 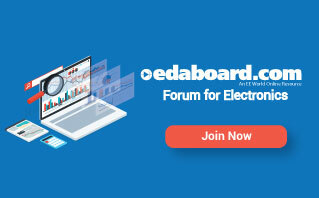 Even with the rapid number of new product introductions that have occurred within the last year, some leading MEMS suppliers have not introduced a 6DoF product yet. So, the choices could proliferate even more in the months ahead.